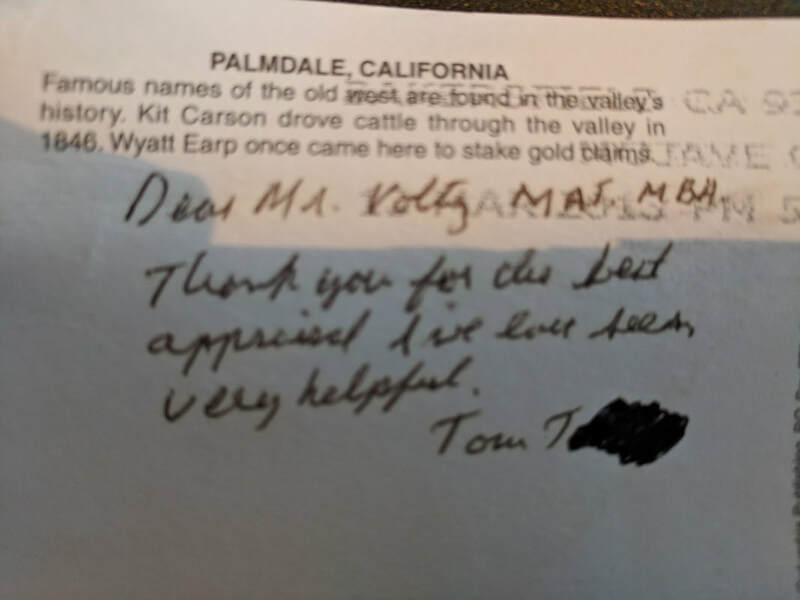 TESTIMONIALS - VOLTZ COMMERCIAL REALTY ADVISORS, INC. Thanks, we are doing well so far. I am always happy to refer you. Thanks for all that you've done on our behalf and I'm sure that we'll do things with you in the future. If you ever need a reference in the future, please feel free to use us. "Many thanks. I really appreciate your professionalism and ability to get this appraisal to me under the circumstances......It has been a pleasure working with you." "Congratulations, Scott! I have first-hand knowledge of your skills and this is just confirmation of what I already knew – that you are a very knowledgeable, skilled, driven, dedicated appraiser and a darned all-around good guy! I wouldn’t have trusted anyone else to handle the appraisals of my dad’s property for his bankruptcy. I will always be grateful." "Our officer would like to thank you for a wonderful job on this appraisal review. Thank you very much"
"You’re awesome! Thank you for your promptness, and I guess it make sense to move forward on this deal." "I really appreciate your comments. They are right on target. At least your comments will back up our decision. Thank you again. Have a wonderful weekend." We have another one in the pipeline and you will be getting it soon." "Just wanted to say thank you for the fast and fair appraisal. Good job. Will recommend you if anyone asks me for an appraiser. Thanks again, Dennis"